Products for Jelly Strawberry Cake. * Beat the eggs very well with sugar while tripling their volume. Add the sieved flour and vanilla with gentle stirring. Take a small portion of the dough and stain it with cocoa. Place the bottom of a round tortilla shape with baking paper. 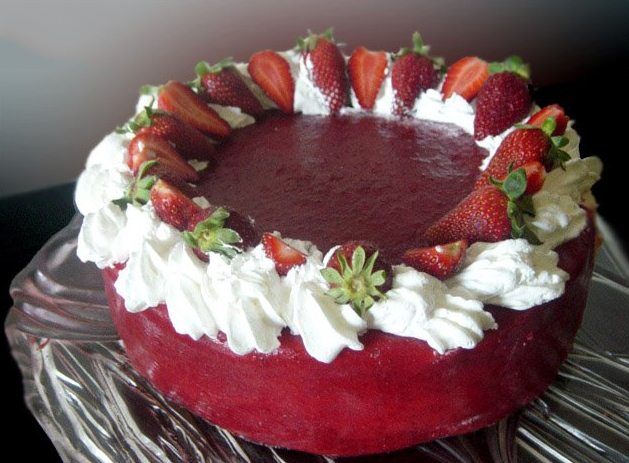 Preparation of Jelly Strawberry Cake. Pour the white dough here and there – chop it with cocoa. Bake the marsh in a pre-heated 170 * oven. Once it has cooled down completely, syrup with the cognac diluted with a few spoons of water. * Wash and clean strawberries. Take some of them for decoration, and the rest paste smooth mashed with sugar. Pour the two sachets of gelatin with a little water and melt it in a water bath. Add the gelatine to the strawberry puree, stir and let it gently tighten. Take 1/2 hr. from the mixture you will later add to the cream. * Cut two nylon bands (of a harder and more flexible polyethylene) that are of a total length as much as the diameter of the cake shape and 2 – 3 cm higher than it. Brush them with strawberry puree and leave them in the freezer to tighten. * Soak the bottom of a small tray with water (about 1-2 cm smaller than the diameter of the cake form). 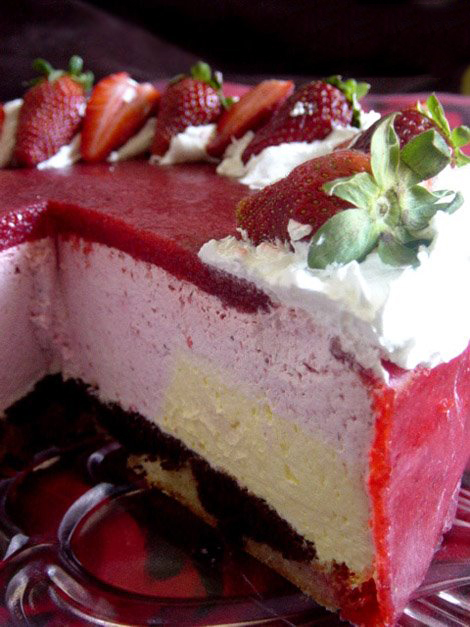 Pour in a little strawberry puree, smooth and let it tighten in a fridge or freezer. Then you will easily remove the jelly by pushing the tip of a knife at its ends. ou can gel it in small bowls or cups. * Prepare the vanilla pudding as indicated on the package. Brush the cream in the snow and split it into two parts. * Add half the cream and a packet of gelatin to the broken pudding, melted in a water bath. * Add to the rest of the cream the strawberry puree that you have previously separated and the other gelatin packet also dissolved in a water bath. * Put the syrupy blade in a tortilla and attach it with the ring of the tortilla shape. “Dress the swamps with the jelly strips. * Brush with the vanilla cream and put on it the jelly strawberries. * Then sprinkle and creamy cream and smooth. * Put the jelly circle at the top. Put the cake in the fridge and let it tighten for 12 hours. * Remove the ring and gently peel off the plastic strips. If the board is taller than the cake, simply bend its edges or cut them. 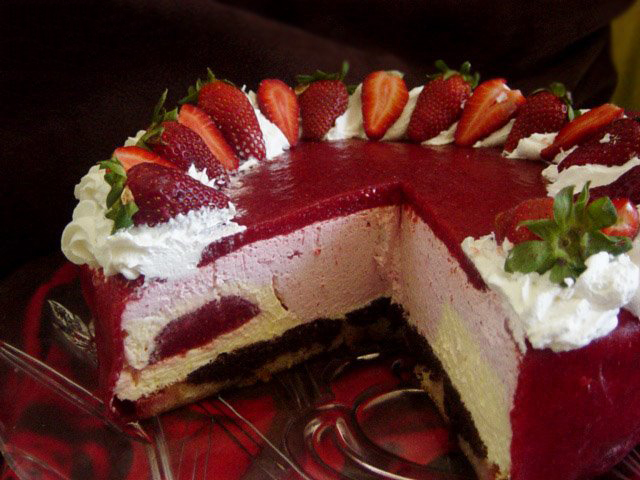 Decorate the cake with whipped cream and whole strawberries. This is a simple and easy strawberry cake. I just wanted to introduce you to a cake “dressed” in strawberry jelly.